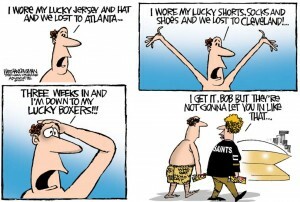 All about the Saints ! Posted in Videos! | Comments Off on All about the Saints ! Great story about Pat and the The Melatauns! Ricks’ hope is to share that diehard fandom with the Who Dat Nation. Because though he works through the day as a barber, he’s also the singer with a group called The Melatauns, who recently released a song they hope will function as a new fight anthem for the Saints. We posted the song a while back, way to go Pat !! Who Dat ! Posted in Who Dat's | Comments Off on The Melatauns ! So true !!! Come on Who Dat Nation let’s get ready to beat the Vikings ! CLEVELAND — The dunk no longer exists. After scoring a pair of touchdowns Sunday, Jimmy Graham tucked the ball under his arm, jogged to the sideline and tossed the ball to someone standing near the bench. The Saints’ performance Sunday at FirstEnergy Stadium was similar to Graham’s new, subdued celebration. There were no thrills, and it was something of a dud for those waiting for this team to slam down an exclamation point on its offseason bravado. The only difference was New Orleans tripped at the beginning of the game, stumbled at the end and ultimately fell to the Browns 26-24. He’d finish his day with six catches for 58 yards, which brought his career total up to 2,288 receiving yards. Thomas’ catches also brought him to within seven grabs of surpassing another franchise record: that of most receptions by a running back, which Reggie Bush set with 294 between 2006 and 2010 before becoming a Miami Dolphin and then a Detroit Lion. METAIRIE, La. – Much was made of the success the New England Patriots had last year against New Orleans Saints tight end Jimmy Graham when they used physical cornerback Aqib Talib against Graham in press coverage. In fact, probably too much was made of it, as few NFL teams have cornerbacks with that ability and no other teams copied the Patriots’ blueprint after that Week 6 matchup. But one way or another – whether he’s being pressed by cornerbacks, jammed by defensive ends or harassed by linebackers – Graham knows he’ll keep seeing new wrinkles in the way teams cover him this season. The Melantauns is a must-have for any connoisseur of authentic New Orleans blues-rock. With that… they have a NEW song for the Who Dat Nation !! Take ’em To The Wood Shed !! Hope you like it as much as we do ! Posted in Who Dat's | Comments Off on The Melatauns ! !